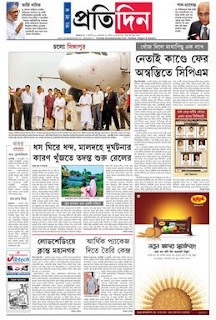 Sangbad Pratidin newspaper (সংবাদ প্রতিদিন) is a Kolkata based newspaper. Covering all the bases of news, local, national and international, the Bengali daily brings the latest from India and around the world, to West Bengal. Sangbad Pratidin is one of the top newspaper in Kolkata.